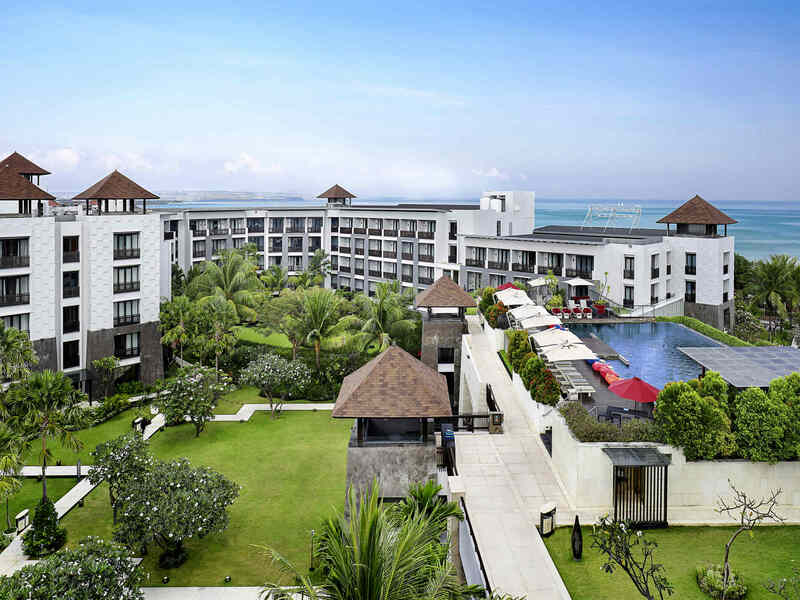 Just a 20 minutes drive from Ngurah Rai International Airport, Pullman Bali Legian Beach boasts a promise of pure paradise and island life charm with 365 beautiful and spacious rooms and suites. The hotel is part of the MyResorts program featuring exclusive experiences for Le Club AccorHotels members. With a roof top infinity pool overlooking Legian beach, a garden swimming pool with kids pool, wellness center and ideal for conferences up to 350 guests. Set between Bali's famous Kuta and Legian Beaches, the attractive resort is a natural and tranquil oasis just steps away from Legian beach where you can take a surfing lesson or simply soak up some sun with a good read while waiting for a dramatic sunset. The hotel is also close to the heart of Bali's recreational areas where you can shop at quaint boutiques and shops, and enjoy bustling nightlife along restaurant- and bar-lined streets. Water parks, art markets, and malls are in close proximity as well. With chic urban style and Balinese hospitality, the hotel features the latest technology and expert advice for organizing meetings, seminars, incentive events and weddings.Three flexible and fully equipped meeting areas can be booked separately or combined to serve as a 320 m² ballroom.We don't want to break your concentration, but the beach is right outside and when the meetings are over or before you head into another one, why not go for a swim? 42 m² / 452 ft², Free WiFi, 32" LCD interactive TV, parquet flooring, safe, tea set, yoga kit, separate bath and shower, private balcony or terrace. 1 extra bed available upon request for IDR 400,000. 42 m² / 452 ft² Room. Free WiFi, 32" LCD interactive TV, parquet flooring, safe box, tea set, yoga kit, separate bath and shower, private balcony or terrace. No extra bed available. 53 m² / 571 ft², Free WiFi, 32" LCD interactive TV, parquet flooring, safe, tea set, yoga kit, separate bath and shower, private balcony or terrace. 1 extra bed available upon request for IDR 400,000. 42 m² / 452 ft², Free WiFi, 32" LCD interactive TV, parquet flooring, safe, tea set, yoga kit, separate bath and shower, private balcony with ocean view. 1 extra bed available upon request for IDR 400,000. 42 m² / 452 ft² Room. Free WiFi, 32" LCD interactive TV, parquet flooring, safe box, tea set, yoga kit, separate bath and shower, private balcony with ocean view. No extra bed available. 85 m² / 915 ft² room, separate living room, comfortable sofa. Free WiFi, espresso machine and tea set, yoga kit, wooden flooring, separate bath and shower, private balcony - tropical garden or pool view. For 3 adults or 2 adults with 2 children. Fresh picked fruit juices and light summer stomach supply around the mainpool on the groundfloor. Fancy drinking culture with a slight portion of dramaturgia around the roof pool with stunning sunset pictures. Trendy all day bar with drinking pleasure catering to style one's life located near the lobby and the main restaurant. It was a last minute booking due to change of travel plans with a sick child. Checkin was swift and the room was great. We didn't really use the facilities except for kids club ( the non sick child ) he loved the experience. Complimentary cocktails were lovely great staff and excellent buffet breakfast. No issues - staff are always courteous and helpful. Would recommend that your fridge facilities are reviewed. Our fridge was not very cold even though we turned it up to the coldest setting. Everything was good. After staying in many hotels I don’t think this is 5* but staff are very friendly and hotel and our room was lovely. On the negatives, the pools are no way near big enough....plus they both in need refurbishment. The infinity pool also left brown marks all over my white bathing costume? The reception said this was due to people are using tanning oil - but I’m not sure this is true as the ground floor pool left no marks. I wouldn’t stay here again due to the pools, but the hotel rooms and breakfast were good. Pullman was a great experience, the breakfast was great, wide variety of quality food, we had dinners at the hotel too, the dinner were so great, the chefs really are 5 star. Pools were clean and fresh towels always on hand. Hotel was clean and staff very accommodating. We felt very well looked after. The staff were extremely friendly and lovely, our rooms were large and very comfortable and the facilities were amazing. Very disappointing. Breakfast cooked food less than satisfactory. Room service meal not edible better Nasi gore gets and satay down the road. Room was dirty, taps leaked, bath didn’t drain, sheets stained, room smelled mouldy. If we didn’t prepay we would have moved hotels. Very enjoyable stay, great location between the tourist hot spots, easy to get too and a good base. Good restaurant and pool bar, but most of all the staff are wonderful. Check-in was delightful, breakfast service welcoming and warm and on departure Arya was engaging and memorable. This was my 5th time to bali but my parents first and they absolutely loved the service and experience. Thank you for being part of that. The rooms are spacious but tired. The bed was very hard but that seems to be an Asian thing and obviously personal preference. I would stay again once a refurb happens. There is a lot of high end choice in Bali and unfortunately the guest accommodation although comfortable and functional didn’t live up to the Pullman standards of a more luxurious experience, felt more like a Novotel. It was nice to had experienced stay even only 1 night at pullman legian bali. Comfort and clean room, gym was excellent, and nice natural garden on environtment inside the hotel. Staff friendly and helpful which enhanced our holiday stay. Nicely located close to all amenities. Delightful breakfast and food. The staff was friendly and helpful. The breakfast was wonderful and overall the stay was much better than I had hoped. Would definitely stay again on my next visit. It was an amazing experience. Got upgraded two tier to suite room and the fire dance show was excellent, and no to forget the megibung at deli restaurant, truly amazing culinary festival. The staff are helpful too. My family stayed only a few nights and were welcomed from the first moment with an upgrade to a suite, complimentary drinks and vouchers. The hotel is beautiful with a very calm and local vibe and the staff are genuine and kind. The Pullman was a great choice and we regret not extending our stay. Very pleasant with high attention to customer satisfaction.